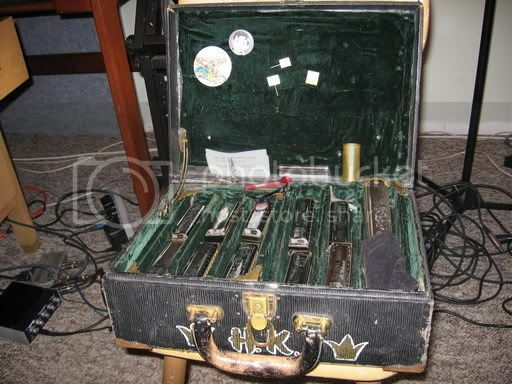 Big Road Blues Discussion Forums • View topic - Harp Players Always gots Props! What's in your Trick Bag? Harp Players Always gots Props! What's in your Trick Bag? Yeah, I axing all youse harp toting characters out dere, dis ?. What props do you use? Do you wear a hat, sunglasses, a harp belt or bandolier. Do you have a real cool case. Is you mike painted like a watermelon or made from a whiskey flask? I want to know. Do you sit at a table near the stage smoking Between the Acts until its time to play? You got a vest, gold tooth, nose ring, pet monkey? Talk about it, get it out front!!!! For instance, I carry my harps in a shoulder bag that has the logo and name of a well-known skizo medication. It gets more attention than my playing. Re: Harp Players Always gots Props! What's in your Trick Bag? i always think a hat and sunglasses are a terribly corny combination on a blues musician unless you are actually playing out doors in the summertime sun.especially now ,when they sell post brittany spears pinstriped fedoras at target.i realize i am in the minority here with this line of thought.it just cracks me up when i see a picture of a guy dressed like a blues brother"gee,i wonder if he plays blues?" haha!!!! please people,i am not trying to insult anybody here!this is my standard and i don't expect anybody else to agree.i am actually interested in this topic and would like to discuss it! 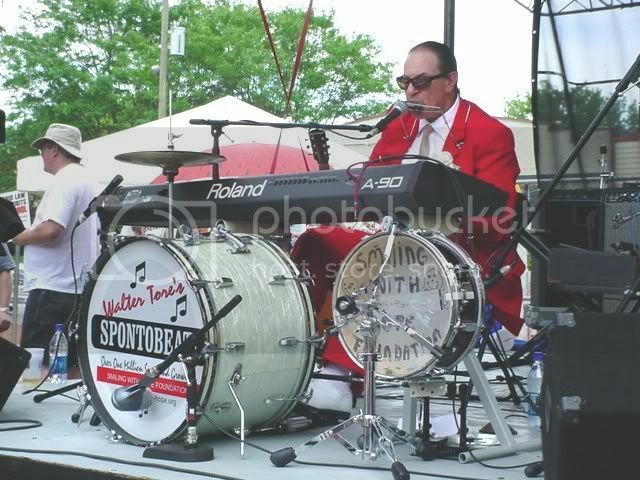 HOWEVER,i think costuming is very important,especially when you are over 30.i do try to wear a tye and jacket,or at least a vest and look nice but not too business like for shows.i find that people do take you more seriously as a blues musician if you look the part and the girls don't seem to mind. SO:maybe i should succumb to wearing hats and sunglasses!hhaha maybe lightly tinted glasses and a porkpie?would i go over better? until recently all my mics were stock paint and worn,but i just started using a black metalflake jt-30 with shaved ears and a bright yellow grill.i have to admit it is fun to have a custom looking microphone.i have noticed people like to see you use a chromatic.big harps they can see now and then. another thing about costuming and appearance,i lost forty pounds since august and i would say it has had a positive effect on how i go over with an audience.i think an audience likes you if you are REAL fat,or fairly in shape,but not in between. i once had a big fight with carrie bell about bandoliers,so i don't want to say too much about them,but i used to think they were dorky,but in tight stages they make lots of sense.especially after you've dumped aalll yur harps off a vibrating amp,or had guitar players tromp a hundred bucks worth of harps into the ground. As you can see from my picture in this forum I wear a vest and a hat. On the vest there are two pins, one is a cleft symbol with a cross in the middle the other is a Christian fish ( <>< ). On the hat is a Christian fish with a fish in the middle. I do not force my beliefs on anybody but alot of people do ask me about the pins. That opens the door for an unexpected conversation on thier part. Believe it or not I have not had anybody walk away or try to change the subject. I am looking for a 3/4 lenth black sport coat like the ones preachers wore in the late 1800's to the early 1900's Instead of the vest. 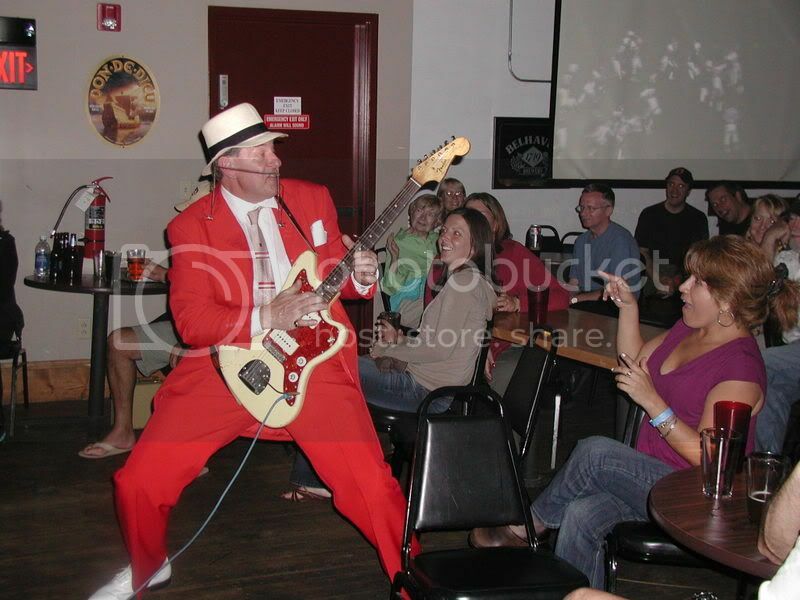 Walter, the jacket, tie, and pick guard matchup is a "KILLER" and the hat works great rather than being a negative. I can tell the chick-a-dee in the front row is really inpressed. I do have one question. Who is handling the lights in that joint? Come on Y'all this is why I created the thread. Nobody should get upset by the replys. Its just what works for you. The only props I keep are a handful of pastel colored plastic harmonicas to give out to the occasional "fan" who wants to build a deep meaningful relationship with me in 5 minutes between sets. They sell these harps out of a fish bowl on the counter at the music store for something like $1.99 ea. They're actually very playable, which seems to satisfy the lucky recipient to the point of needing another drink, lol! I save the pink ones for the gay guys who really adore me. I only wear sunglasses when it's too bright outside for my regular glasses. I don't use any tricks or gimmicks. I sometimes use a wireless mic, but that's more for convenience than anything else. But I have been known to walk around the venue while playing through the wireless, but it's been a long time since I've done that. jeffl wrote: The only props I keep are a handful of pastel colored plastic harmonicas to give out to the occasional "fan" who wants to build a deep meaningful relationship with me in 5 minutes between sets. They sell these harps out of a fish bowl on the counter at the music store for something like $1.99 ea. They're actually very playable, which seems to satisfy the lucky recipient to the point of needing another drink, lol! I save the pink ones for the gay guys who really adore me. that's a great idea.i used to use johnsons,old standbys etc. for this but it was getting kind of pricey! walter,love the tie ,and are they white bucks?too cool.the shoes make the outfit.too cool. pastor:we call a "christian fish" an icthus where i come from.do you ever listen to buddy green?talk about some GREAT christian harmonica! Oh Buddy Green yep he can really do some amaizing things with Christian music. I've been working on This train's a-commin. Not doing to bad but not ready to play it up front yet. Yeah, Walter makes most of us look like slouches. He got the look. Walter IS the prop, lol! I confess to having thrown some pocket combs into the audience when I was playin' in a 50's rock band back in my college days. We had an entry shtick where the drummer used to come on stage first and lay down a boogie, and I'd come out with my slicked back hair and start takin' swipes through my hair and throwin' the combs out into the crowd. I'd throw 2 or 3 of 'em out there and then I'd grab a harp and join the drummer layin' down a boogie while the rest of the band came in one by one and built the tune up from the bottom. It was a pretty good shtick. We'd precede it by havin' the bands' voices comin' out over the PA, askin' for the Brylcream, etc., and jus' generally horsin' around and banterin', from off stage. Last edited by watertore on Fri Jan 23, 2009 5:25 pm, edited 1 time in total. As a Guitar player who uses a little racked harmonica to add flavor to his shows, I'd have to say the harp is the bag of tricks. Even a merely passable harmonica player can add textures the audience immediately knows, from soulful to hokey. 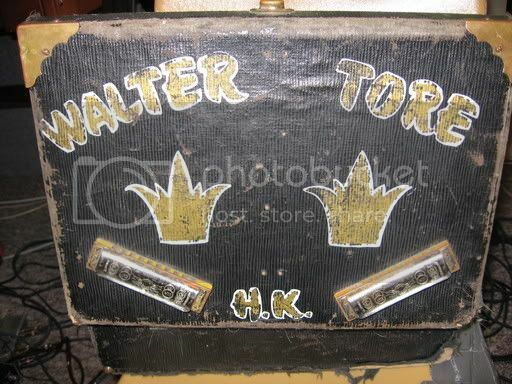 To steal from another post, harmonica is what puts a pork pie hat on the music. I use this baseball bucket with pockets to store my harps and stuff, and as a seat when I'm playing Farmers Markets. You exercise the utilitarianism of a Minnesota Ice Fisherman Dan, lol!